Great performance of Roman Oraczko-Misiaszek ! 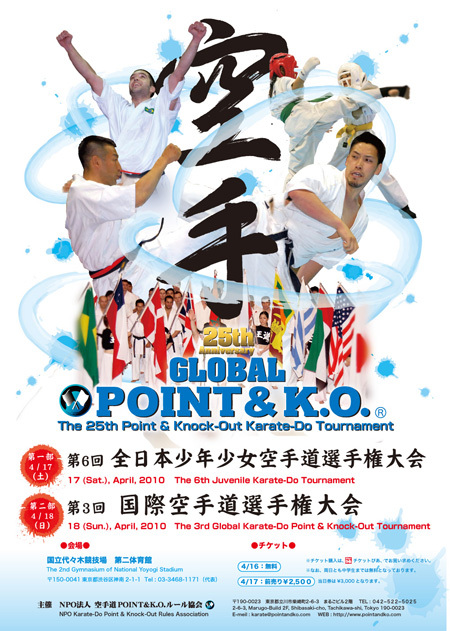 The 3rd Global Point & K.O. 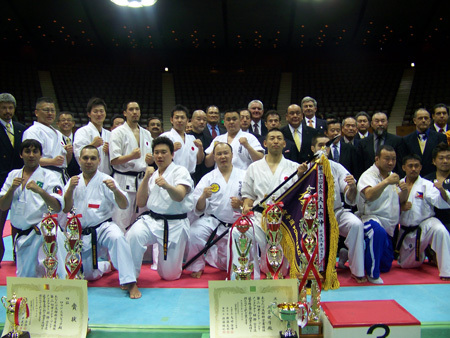 Karate-do Tournament, under the auspices of Ministry of Education, Culture, Sports, Science and Technology (MEXT) in Japan took part in the Gymnasium of National Yoyogi Stadium Sports Hall in Tokyo. 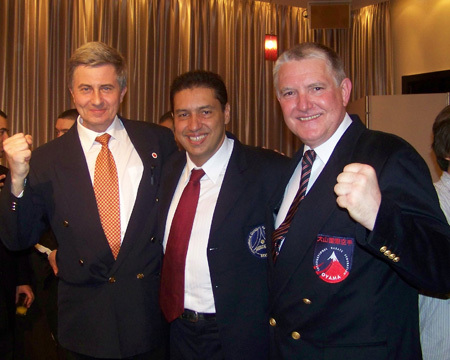 At the invitation of the Grand Master Katsuaki Sato, the first IKO Kyokushinkai Worlds Champion, representation of four members from OYAMA Polish Karate Federation with its leader Hanshi Jan Dyduch arrived in Tokyo. The Polish fighter Roman Oraczko-Misiaszek, in the impressive style, won the 4th place as well as the cup for the Most Courageous Fighter of the Tournament. Congratulations, OSU ! Despite many difficulties in air transportation connected with the eruption of a volcano in Iceland, the representatives of 15 countries took part in this year's global tournament. During the opening ceremony, with a minute of silence was honored Lech Kaczyński, the dead President of Poland, and other victims of the air disaster in Russia. The tournament had a very nice artistic setting, exemplary prepared by the host. Congratulations to the Organizers, OSU! Enrico Magalhaes, Brazil, the 2008 World Champion, swears an oath on behaalf of the fighters. All the fights were in the system different from the rules of knockdown. In accordance to the Point & K.O. rules, not only did the referees give ”ippon” or ”wazaari”, but also points for dynamic not blocked kicks directed at torso. The referees prefered activity and fast kicks directed at “jodan” zone, whereas single low kick were often were punished with warnings. On the way to the quarter finals, Roman Oraczko-Misiaszek beat 15-20 kilos heavier opponents: Chuluudai Naranbatara, Mongolia and two Japanese fighters Kawakita Masakazu and Shinji Nishida. In the semi-finals, Roman lost after a stiff fight with this year's World Champion, Tadanobu Oue, Japan. During the fight for the 3rd place, he was defeated by one technical point by Takeshi Kamikura, Japan. The last opponents were also taller and at least 15 kg heavier than the Polish fighter. 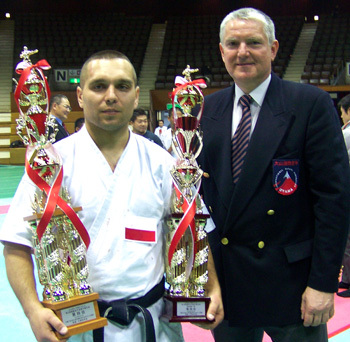 The courage and diversity of attacks of modest Oyama Karate fighter from Poland was fully appreciated by the Japanese audience and organizers. 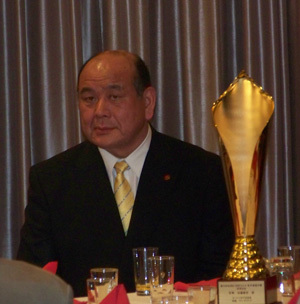 The Grand Master Katsuaki Sato honored him with the Cup of William Oliver for the Most Courageous Fighter of the Tournament. Commemorative photo of the participants of the Tournament. 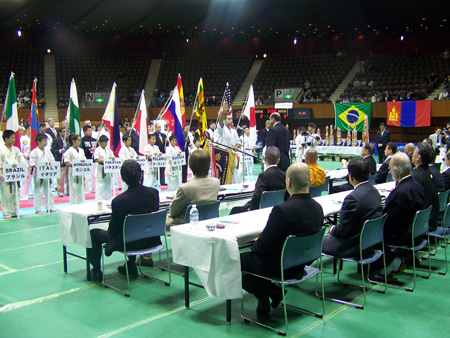 The 6th Juvenile Karate-do Tournament in kumite was organized the day before the 3rd Global Point & K.O. Karate Tournament. At the invitation of the Grand Master Katsuaki Sato, apart from the hosts, the prizes were also handed in by Hanshi Jan Dyduch 8th dan. Hanshi Jan Dyduch during Junior's reward ceremon. During the reception, in Keio Plaza Hotel, President Katsuaki Sato was given by the representatives of OYAMA Polish Karate Federation a commemorative cup with congratulations on the 25th anniversary of his establishment of Non-Profit Organization Karate-Do Point & K.O. Rules Society and the 35th anniversary of winning The First World Open Karate (Kyokushinkai) Tournament in Tokyo in 1975. During Sayonara Party, our representatives had a lot of time for social conversations, making new sports contacts taking friendly pictures. 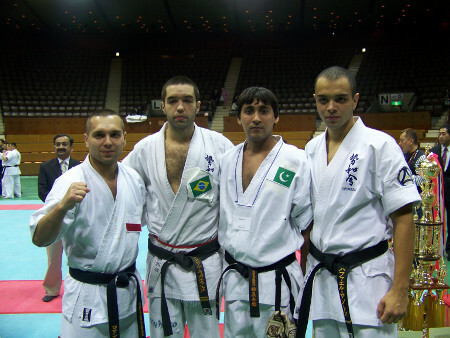 Jan Dyduch and Jerzy Walaszczyk with Ademir da Costa, the leader of Seiwakai Karate, Brazil. Impressive poster from the tournament in Japan.